Technical Regulations as agreed for S M C events. 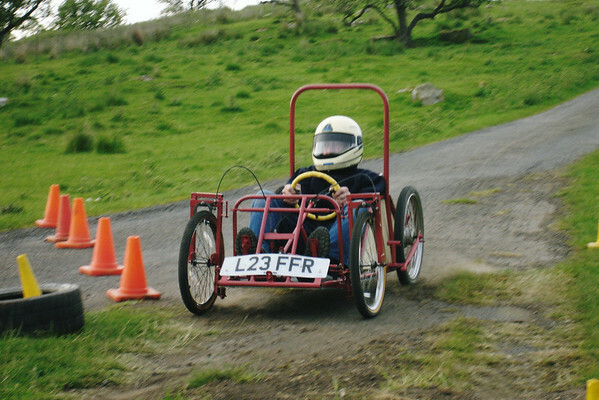 The kart cannot be made by utilising an old racing kart chassis. The maximum dimensions of the kart must be that, the karts maximum track and wheelbase will fit inside an imaginary box, with dimensions of 48” long by 36” wide. The kart must have four wheels. Two steering and two trailing or being pushed. Tyre / wheel choice is free but no racing kart wheels or tyres will be allowed. There must be an effective braking system acting on at least either the front, or the rear axle. In effect, providing braking effort to a minimum of two wheels, otherwise the braking system is free. Steering preferably must be by either a steering wheel or handlebar/tiler system. However, whichever of those systems is used, the system must then operate using mechanical linkages. (ie not string operated). The drivers must sit in a seated position ie not prone. The seat must be securely fixed to the chassis / bodywork. If more than one driver is to use the kart and the seat has to be moved, then there must be an effective method of securing the seat in each of those positions. There must be no mechanical or electrical means of powering the kart – gravity only or pushed by the driver. Streamlining and aerodynamic aids, wings etc will be permitted. However no sharp edges or projections will be allowed. It must not be possible when on either full lock, for any of the steering system to contact with the driver’s body other than the steering wheel, or whichever system is used. If spoked wheels are used, a guard should be fitted to provide a means of protecting drivers fingers and or limbs from becoming entangled. Rollover bar is recommended but not mandatory. All limbs must be covered by clothing, overalls recommended. Helmets must be worn. These do not have to be to MSA spec and as a bare minimum, cycle helmets would be accepted. Gloves must be worn. Competitors below the age of 18 years old must have the signing-on sheet counter signed by the parent or guardian.